Discussion in 'Distributed Computing' started by Gilthanis, Apr 9, 2018. I am working on my 1 million point goal for every active project. Been working hard on RALPH while it has work units. Would like to get SZTAKI and SourceFinder before they end, but I don't see me get enough work units to make that happen. ODLK1 has work that I can chew on for a small bit but then I'm out of projects with consistent work and just down to the ones that might as well be dead or barely have a trickle through the year. What is the URL to get that view of MM's at Free DC? I can't figure it out. Currently working on 10million at both CSG and RakeSearch. I also have several projects where I am trying to reach 1million, but none of them have more than a trickle of work, if that, so I may never reach 1million on those. RFGuy_KCCO, you may want to make sure your rigs are attached to Ralph and asking for work. They have had a lot of CPU work units lately. This is one of those times to grab what you can while you can because the getting is good. I've reached 300k points towards the 500k milestone. Not sure what some of these mean, but what the heck. Trigggls : Having 10000 - 10100 credits in a project. Boks : Having 100000 - 101000 credits in a project. Teraboks : Having 1000000 - 1010000 credits in a project. Maxwells: Having at least half the milestone count of the #1 person in a category. For example: in the 500k category, let's say the #1 person has 70 projects. If you have at least 35, you get a Maxwell. Clanks: number of projects you've earned credit in during the past 28 days. Vaios: number of projects where you rank in the top 5 based on your join date. 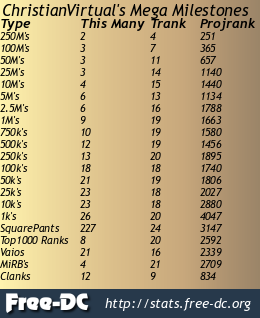 MiRBs: number of milestone categories in which you rank in the top 1000, excluding the MiRB category itself. Having 893 Squarepants is probably something I should be pleased with but I can't be sure. So SquarePants is all the other numbers added up? Sure, that makes sense; but I like SpongeBob, so I'll roll with it. anyone know what Bozos are? Hmmm..had not seen that one yet. Will have to ask bok. My first Bozo on Moo! I think I'll keep this title for a while, if I can unless Moo! got selected for sprint or penta. Hmm, tough choices or maybe I'll just crunch for HardOCPtest.